Netaji Subhas Chandra Bose was a great freedom fighter, nation builder and pragmatist. Born on 23 January, 1897 in Cuttack (Orissa) to Janakinath Bose and Prabhavati Devi, he was the ninth child among eight brothers and six sisters. His father, Janakinath Bose, was an affluent and successful lawyer in Cuttack. Subhas was a very intelligent and sincere student. He passed his B.A. in Philosophy from the Presidency College in Calcutta. Since his early days, he plunged into the freedom struggle. Initially, Subhas Chandra Bose worked under the leadership of Chittaranjan Das, an active member of Congress in Calcutta. He regarded Chittaranjan Das as his political guru. Bose had been in civilian politics close to two decades (1921-1940), inclusive of his 11 imprisonments, working for India’s independence at home and abroad. He was essentially a political thinker and philosopher who put forth his ideas in numerous speeches, books, essays and letters. A ‘faith philosophical’ was the anchor of his actions. He says, in his unfinished autobiography “An Indian Pilgrim”, - ‘Reality, therefore, is Spirit, the essence of which is Love, gradually unfolding itself in an eternal play of conflicting forces and their solution’. It shows how his mind was at a plane different from that of career politicians of the day (he himself had been the Chief Executive Officer and later Mayor, Calcutta Corporation). He also identifies the source of his inspiration. He says, ‘I was barely fifteen when Vivekananda entered my life. Then there followed a revolution within and everything was turned upside down”. Vivekananda, says Subhas Bose, gave him an ideal for which he could give his whole being. A week before Subhas Bose was born, Swami Vivekananda had pronounced a new conception of India at Colombo, Sri Lanka (then Ceylon). To the contemporary political leadership, India was an evolving political, constitutional and economic construct. But Vivekananda said that Indian civilization had maintained its uninterrupted continuity unlike other civilizations of the world because its soul lay in spirituality not political institutions. He also said that India was a land of spirituality and renunciation. Her mission is to conserve, preserve and accumulate her spiritual energies and deluge the world with that concentrated energy. If not moored to such a lofty ideal, Subhas Bose could not have given the ‘heaven born service’ after qualifying the ICS examination in 1920. He was placed at No.4 in the merit list- the highest position secured by any Indian in the history of the ICS. But he chose to serve the motherland instead of colonial masters. He got into touch with C.R. Das (1867-1925) – his future political mentor- first through letters and then in person. Their association lasted for only four years due to untimely death of Das and imprisonment of Subhas Bose. But those were enough to launch him into constitutional politics. He was one of the nine members of committee led by Pt. Motilal Nehru that produced the “Nehru Report” (1928) on dominion status. Subhas Bose believed in a fine balance of subjectivity and objectivity. While visiting Cairo for a single day in January 17, 1935 he combined contemplation with a political meeting with Egyptian nationalist leader Mustapha El-Nahas Pasha of Wafd Party. Pasha expressed confidence that Hindus and Muslims of India can work together in the best interest of the nation like Muslims and Copts in Egypt. Subhas Bose, standing at the base of the Pyramids, realized the similarities and differences between Egypt and India. They were both very ancient civilizations. ‘Our emphasis was not on civilization but on culture; not on material side of life but on the intellectual and spiritual. Therein we had our advantages, as well as our disadvantages. Owing to our superior thought power, we could hold our own against invaders from outside even when we were vanquished physically for the time beingand in course of time we could absorb the outsider, while the ancient Egyptians went down before the Arab invaders and disappeared altogether’. But India, he felt, had neglected its material side while developing the spiritual side. This in the long run enervated India spiritually as well. Therefore, he preferred ‘the golden mean between the demands of spirit and of matter, of the soul and of the body- and thereby progress simultaneously on both fronts’. His musings at Pyramids, therefore, sum up his political vision for India. He wanted to see a modern India that is industrially self-sufficient and militarily self-reliant. Yet, it would not be out of sync with India’s native genius. His Presidential Speech at the 51st session of Indian National Congress at Haripura (1938) concluded as-“We are, therefore, fighting not for the cause of India alone but for humanity as well. India freed means humanity saved”. But his idealism never got better of his pragmatism. He was aware that political freedom without economic reconstruction was hollow. He was the first to broach the subject of national planning. He knew Indians sooner or later will have to assume the political responsibility for India. He said, “The very first thing that our future national government will have to do is to set up a commission for drawing up a comprehensive plan for reconstruction”. His Presidential tenure saw the genesis of a Planning Committee, despite the lukewarm attitude of the Congress. Twenty nine subcommittees, formed into eight groups, were set up with special terms of reference to deal with all parts and aspects of the national life and work according to a pre-determined plan. Though the exit of Subhas Bose from Congress, outbreak of the World War II in 1939 and imprisonment of Nehru impeded its work, it was revived by the efforts of K T Shah in 1945. The Planning Committee was the forerunner of the Planning Commission in independent India with scientist Dr. Meghnad Saha, an associate of Subhas Bose, playing a major role. Though the Planning Commission has been renamed as Niti Aayog (National Institution for Transforming India) the idea of national planning remains intact. The tribute should go to the farsightedness of Subhas Bose. Subhas Bose recaptured the Presidential post in Congress at Tripuri (1939) through an election. He defeated the official candidate Pattabhi Sitaramayya. It was Subhas Bose’s uncompromising attitude against the British, which made him a misfit in the Congress. His political differences with Gandhi and Jawaharlal Nehru made him to quit it completely. He set up “Forward Block” which was based on Leftist agenda. The beginning of the World War II upset his political plans. Interestingly he met veteran revolutionary Veer Savarkar at Bombay in June, 1940. Savarkar was the first to tell him to go out of India, and build an army of resistance in Japan with Rashbihari Bose, with whom Savarkar was in touch. It was in Germany (April 1941-Feburary, 1943) that his Indian associates gave Subhas Bose the title ‘Netaji’. A resolution was passed to make ‘Jana Gana Mana’ of Rabindranath Tagore the national anthem of free India. Subhas Bose had raised a mini version of Indian National Army (INA) in Germany in 1941. It was called the Indian Legion. It was also in Germany that he set up ‘Azad Hind Radio’ as broadcast arm of India’s overseas freedom movement. Its broadcast was receivable in India. Prime Minister Narendra Modi, in an edition of Mann Ki Baat, said Subhas Bose exemplified the influence of radio broadcast on public mind. 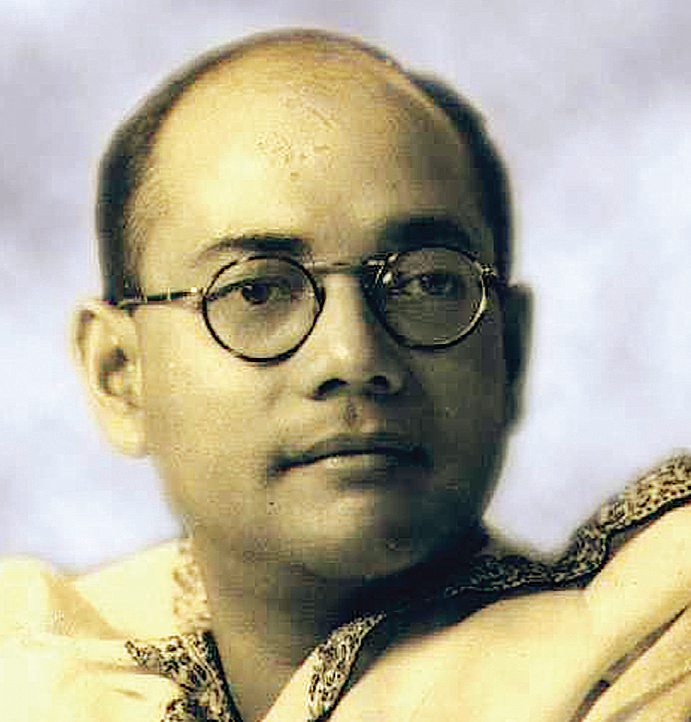 Subhas Bose was always a youth icon. He was perhaps the only political leader to be in the forefront of both non-violent and revolutionary forms of freedom struggle. His transition from civilian politics to militaristic role thus seemed very natural. On his the 119th birth anniversary this year, focus of the nation is on the declassification and public release of the first batch ‘Netaji files’ by the central government. Earlier, on September 19, 2015 West Bengal Chief Minister Mamata Banerjee had released the digitized version of 64 confidential files on Netaji in possession of the state government. On October 14, 2015 the Prime Minister, Shri Narendra Modi, while hosting the extended family members of Netaji and some public activists, at 7, RCR announced to declassify the files on Netaji available with Government of India. It is estimated that there are as many as 130 files on the subject. It is expected that the declassification of files will clear the mysteries surrounding Netaji’s life and people would be able to know whether Netaji survived the alleged Taihoku air crash in August 1945. The author is an independent researcher based in New Delhi. He is currently a Consultant, Ministry of I&B. Views expressed are his personal.